As a fire sign, Sagittarius is unable to sit still for very long. That’s why Neptune in Sagittarius is able to find inspiration wherever they go – it’s the traveling that keeps them excited about life. They love meeting new people, learning new things and building upon their wealth of knowledge. (Get your free travel horoscope). Neptune represents instinct, illusion, spiritual enlightenment, chaos, addictions, mystery, fantasies. 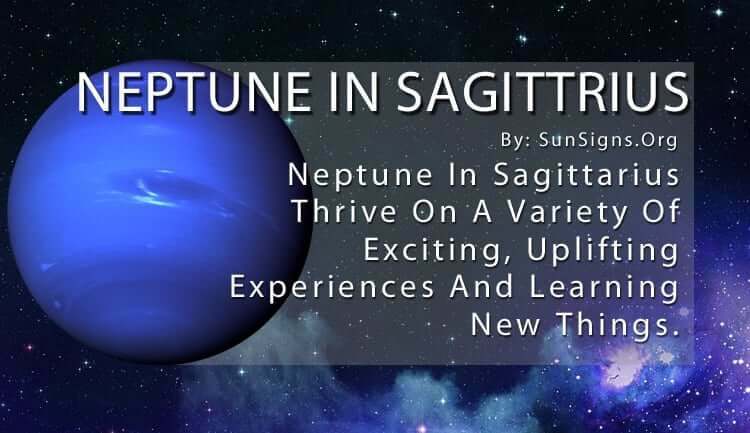 For Neptune in Sagittarius, they thrive on a variety of exciting and uplifting experiences. (Find out more about Neptune symbol meanings in astrology). They are always on the go and will drop everything to take a surprise trip. They aren’t interested in day-to-day activities or responsibilities; they don’t have the time for such mundane things. Neptune in Sagittarius people is always seeking the next adventure to keep their mind sharp and constantly expanding. They love a challenge and thrive on overcoming adversity. That’s part of how they remain so active. They go where they have never been before and explore the region. And all this happens without a plan so they can remain as spontaneous as possible. They go everywhere with an open mind and an open heart, which helps them to make new friends but can also lead them into precarious situations if they aren’t careful. If you can appeal to their desire to learn, you may be able to teach them a different viewpoint. Once they realize there is more than one right answer to something, they will be able to show more compassion toward other people. It’s important for Neptune in Sagittarius to realize that not everything can be simplified down to two sides. (Find your Spiritual Sign to understand better). The main thing Sagittarius Neptune zodiac sign has to be cautious of is overstepping boundaries. Because they are so knowledgeable about an array of subjects, they can also be quite opinionated. They can become obsessed with a cause or social issue that blinds them to others’ thoughts and ideas about the topic. And they get so excited they tend to try and force their beliefs onto other people. This is never done in a malicious way. Mind you – they simply want to share their knowledge and viewpoint with the world to draw their attention to something they think is extremely important. Their fiery passion sometimes overwhelms their better judgment, making them seem almost like a bully at times. Be delicate when confronting them about this, though, because they often don’t realize what they are doing. (Find out how it is dating a Sagittarius man). It’s a delicate balance for Neptune in Sagittarius to achieve spiritual enlightenment. While all of their traveling and life experience satisfies their soul, they have to watch out for negative consequences that can pop up out of nowhere. Because they don’t have a plan they are more susceptible to problems that can interfere with their happiness. They are masters of overcoming obstacles but that sometimes comes along with a price. They have to be aware that too many unintended repercussions can start to weigh down on their conscience and bring them a step closer to depression. But as long as they are cognizant of this potential phenomenon, they are able to avoid the negative effects of depression. This allows them to continue with their ideals and build upon their vision for a better world. The philosophy of Neptune in Sagittarius is usually a positive one, where they feel they can initiate the change they want to see. If they can keep their focus onward and upward they can do great things.